Antari X-510 Fog Machine DJParts - All Variety of Parts that DJ Needs. 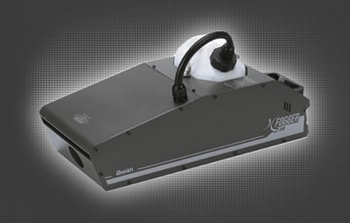 X-510II - 1000W Fog Machine. This 1000W machine is equipped with Antari’s new technology aluminum cast heat exchanger and can generate more fog than any other machines in its class due to its greater mass and higher efficiency. Optimum fluid vaporization is achieved thanks to this ground-breaking heater core technology which ensures only the driest, purest white fog is produced to the satisfaction of all industry professionals. An electronic fluid level detecting sensor will stop operation and offer complete protection to the pump whenever the fog liquid is running low. The high specification electronics design is modular and the control interface offers the user the ultimate in X-Series control options, whether it DMX Analogue Auto Timer or Wireless. Just plug in the desired module and you are free to fog. This extremely affordable machine has all the innovative X Series features. It is the perfect solution for all effect intensive productions. • Output: 10,000 Cu.Ft / Min.